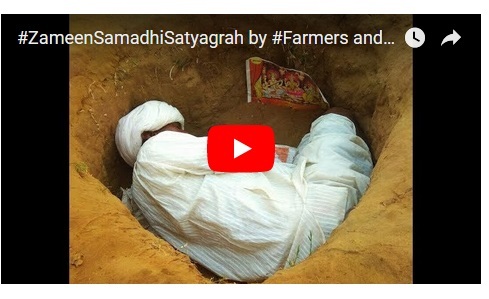 Jaipur: The Zameen Samadhi Satyagrah (land burial satyagrah), which began on October 2 at Nindar village, situated at the outskirt of Jaipur, has entered into its 21st days. Around 2500 farmer families of Nindar village are neck-deep into protest against Jaipur Development Authorities (JDA), which has forcibly acquired their 320 hectares land in Nindar. The protesting farmers, both male and female have been forced to celebrate Karwa-Chauth, Diwali, Govardhan Puja, and Bhai Dooj at the protest site only, within the pits and trenches. Earlier, some farmers had fallen ill, due to staying semi-buried in the soil for long hours. This is one of the most heart-wrenching protests in India by the farmers, Vasundhara Raje led BJP government has yet to wake up to the issue. Along with male farmers, their counterparts, female farmers and their children remain shouting for their rights, against JDA, their voice are getting louder, but yet to reach state government. Earlier, in Sikar, when farmers of Shekhawati region had sat on indefinite strike and blocked most road, government had to listen them within a fortnight. Watch our video story, showing the fight and plight of the farmers, their families and festival celebrations. Congress helps Shivraj appoint new Lokayukta, secretly!